EWEA (The European Wind Energy Association) is a not-for-profit organisation representing the wind energy industry. EWEA is united in its vision of a sustainable energy future. Through effective communciation and its engagement in the political decision-making processes, it is EWEA’s objective to facilitate national and international policies and initiatives that strengthen the development of European and global wind energy markets. With over 700 members from almost 60 countries, EWEA is the world’s largest and most powerful wind energy network. EWEA connects members to decision-makers and nationwide associations as well as supports them by providing experience, expert advice and intelligence applicable to challenges faced by the industry. 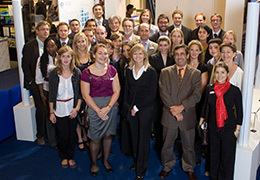 Established in 1982, EWEA has been organizing international industry events for 25 years. By understanding and listening to the needs of the industry, EWEA strives to provide industry events that are customised to meet the industry’s needs and deliver real measurable return on investment.